"Passionate about my career as a registered occupational therapist and certified hand therapist, I challenged myself to find a way to help my patients gain control of their hand tremors in all aspects of daily living. Many adaptive devices currently on the market (weighted utensils and modified pens) may help to counter tremors, but most are task-specific, costly and are far from subtle. 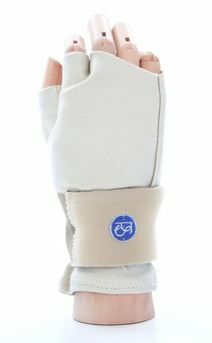 With all this in mind, I designed the Readi-Steadi® glove to serve as a single tool to reduce both resting and action tremor in a way that is comfortable, low-maintenance and cost-effective. I am beyond thrilled that the Readi-Steadi® glove has already helped so many patients regain their confidence and enjoy life again! Currently, I am custom-fitting patients in Baton Rouge, Louisiana at Sage Rehabilitation Hospital and Outpatient Services, but I'm very pleased that modern technology has allowed me the ability to offer online assessments and custom-fittings through this website. I'm excited to help you get started on the road to a better lifestyle!" medication changes, or other factors. all-day use in any private or social setting. extendable wear time, preventing excessive muscle fatigue. The Readi-Steadi® glove is custom fabricated in the USA and is covered by most major insurance companies including Medicare. A physician’s order for the Readi-Steadi® glove is required. JUST RECEIVEd YOUR Readi-Steadi® SYSTEM? Privacy Statement: We will never share your email address or personal information with third parties.